In his writings on totalitarianism, George Orwell powerfully exposed the link between the manipulation of language and the erosion of individual liberty. Ideologues understand that linguistic control precedes, and is crucial to, political and cultural power. The novel 1984 illuminated the shame in being compelled — figuratively — to endorse the lie that two plus two is five. For those who follow gender politics, vocabulary manipulation by ideologues is one of the biggest cultural stories of our time. No ideologues make more aggressive use of this strategy than radical male-to-female transactivists. They can be ruthless in mobbing anyone who dares to resist their linguistic hegemony. Transactivists reserve particular animus for the thought crime they perceive in the factual statement that “a transwoman is a biological male who identifies as a woman,” rather than the official transactivist mantra that a transwoman “is” a woman. Such an absurdity — a woman literally redefined as a man or a woman — could be sloughed off as an over-reach if politicians, the justice system and school boards were not similarly complicit in enforcing compliance with this lie. Lies have real-life consequences. If they were identified as transwomen rather than “women,” it would be a very different conversation. Those who were born female would not be fighting tooth and nail to keep “transwomen” out of intimate spaces such as locker rooms, shelters and prisons. It wouldn’t be an issue. In England, Karen White, born Stephen Wood, served 18 months for sexual abuse of a child. She was on remand for three rapes committed as a man. She identified as a woman, although still wholly biologically male. But, because well-meaning sympathizers like the BACP insist a man is a woman if he says he is, they housed her in a women’s prison. And within days of her transfer to New Hall prison in West Yorkshire, White had sexually assaulted four women. Radical transactivists, with the complicity of progressives earnestly attempting to support what they perceive as a vulnerable victim group, are guilty of the worst form of misogyny in their ruthless campaign to erase from our thoughts the human female body as a unique life form. Many feminists understand this, and they comprise the frontlines of resistance to this movement. For their pains they have earned the condescending sobriquet of “TERFs,” trans exclusionary radical feminists. The unhinged ugliness displayed by male-to-female transactivists toward these women online and occasionally in violent physical confrontations is disturbing. This form of misogyny has crept into the discourse of those with the political power to intimidate private citizens. 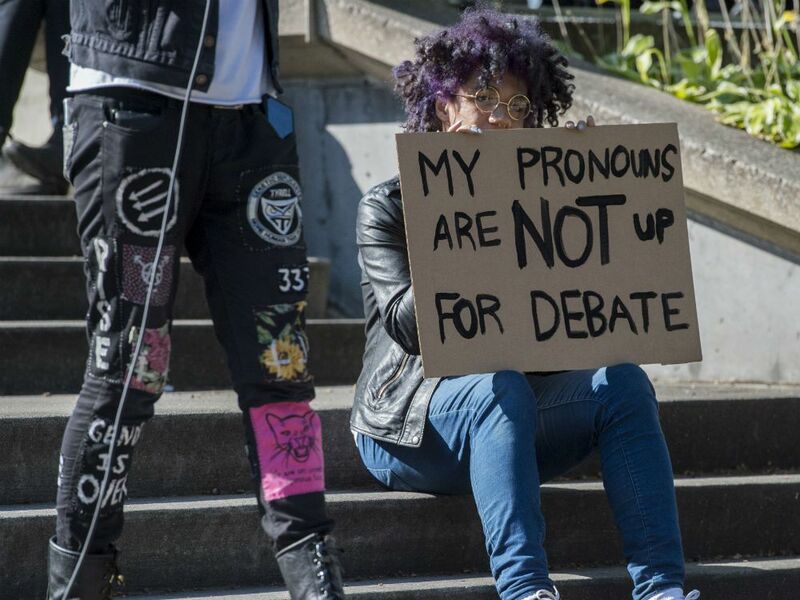 In January, a feminist attending a #MeToo women’s march in Vancouver held up a sign reading in part: “Transwomen are men. Truth is not hate … woman is a biological reality … I am a female.” A photo of the woman and her sign appeared on social media. Given her history of transactivist rights militancy since she transitioned in 2013, her bid to learn the woman’s identity (and a subsequent threat to take her to a human rights tribunal) carried alarming overtones to many observers, which resulted in a lacerating public letter of denunciation, with 100-plus signatures, to the NDP and Premier John Horgan, demanding censure of Oger (with no resulting action). Categorization is the basis of knowledge. Whatever is going on in his mind and heart, a biological male “is” not a female. Two plus two “is” still four.